Delphine Duplessi is a descendant of renowned French courtesan La Lune. As a “daughter of La Lune”, she has inherited psychic gifts, but also a curse. Her gift is that she is able of drawing “shadow portraits”, which depict people’s secrets. Unfortunately, Delphine’s gift comes at a high price, for her personal and love life have suffered in consequence. Because she drew the shadow portrait of the man she loved and saw herself committing an unspeakable crime, she has left that man and moved from Paris to New York, where she has lived for the past five years. She has made a living in New York drawing shadow portraits for the rich at society parties, but when one of those portraits triggers a tragedy in high circles, Delphine comes to re-evaluate her psychic powers and how she earns a living. 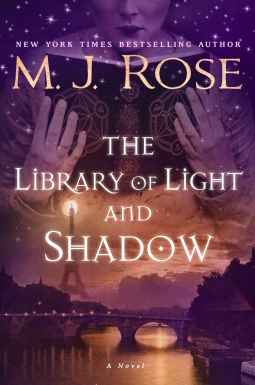 I requested a galley of The Library of Light and Shadow by M.J. Rose because I read The Book of Lost Fragrances by the same author and really liked it. This novel has two parallel storylines; one is set in 1925 (the present) and another, told from the perspective of journal entries, set in 1920, the time when Delphine had a love affair that changed her life in meaningful ways. I liked the storyline focusing on the present, Delphine’s psychic gifts, and the consequences of her actions more than I did the romance. I think if the book had focused purely on the present time it would have been much more successful, even great, but I found Delphine’s pining for her lost love so annoying that I almost felt that I wouldn’t continue reading if the book didn’t improve, fortunately it did after the second half as a new subplot was introduced, which made the book more interesting than the first half. It sounds like a challenging plot and one that I gather was not entirely successful. But at least you enjoyed the second half. Sometimes half a book is better than none! The plot was interesting enough though I didn't include in my blurb the part about the title. I usually enjoy paranormal romance, but this one was a little too much for my practical nature. I have never made it through a book by this author. Well, I only tried one and don't remember the title. I am glad it got better for you by the end. I liked The Book of Lost Fragrances a great deal. Like this one, it is beautifully written; where she lost me was in too much self doubt and whinnying. It became annoying after a while. I realize that reading it after Daniel Silva was not a good move on my part, because both topics couldn't be different. Yeah I'd like to have psychic powers so that part seems more interesting to me than the cloying part. I'm curious about her reevaluating her powers. I'm glad it turned out better in the second half! Yes, fortunately the second half was better. This sounds like a book that I might enjoy although it's a shame that certain elements of the story brought it down a little for you. I think it was just for me because this book has very good reviews on Amazon.